At the opening of his speech, Romney made one thing clear. “I’m not here to announce my candidacy for office,” he said. But, in a sense, it was just that declaration, however unorthodox. 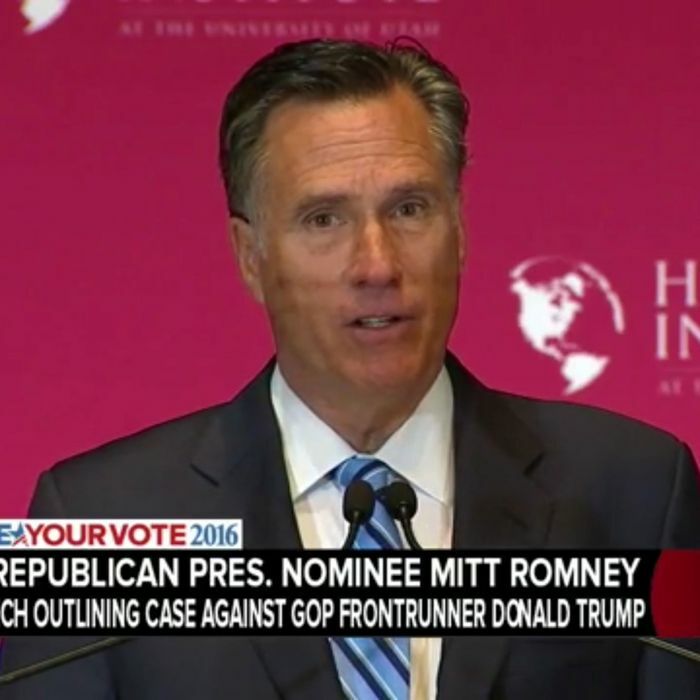 The scenario that’s been floated in recent days by GOP insiders I’ve spoken to is that Romney could enter the Republican primary race late in California and New York to deny Trump the delegates necessary to clinch the nomination. Then, at a brokered convention, Romney would emerge as the party’s choice on a second ballot. There’s no real hope that Romney would be able to beat Clinton — it would essentially be a suicide mission — but losing in 2016, while being able to cast the Trump phenomenon as a fringe aberration, would be better for the party in the long run. Romney’s speech contained many hints that he could put this plan into action. He included the requisite praise of Establishment candidates. “The only serious policy proposals that deal with the broad range of national challenges we confront today come from Marco Rubio, Ted Cruz, and John Kasich. One of these men should be our nominee,” he said. But as each day goes by, with none of these candidates demonstrating an ability to stop Trump, the GOP seems to be grasping for an alternative. And the logical one is Romney himself. Romney spoke of putting country first. “We’ve been blessed with great people, people who placed the interests of the country above their own,” he said, further describing a Trump presidency as a dystopian hellscape, like the alternate 1985 ruled by Biff Tannen in Back to the Future II. He cast this outcome as the end of the world as we know it. “There never was a democracy that hasn’t committed suicide,” he said, quoting John Adams. To prevent this, Trump must be halted. Romney may not have explicitly volunteered for the job, but he has now made clear his willingness to be drafted.